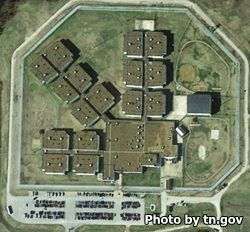 Hardeman County Correctional Facility is located in Whiteville Tennessee. It is a medium security prison that can house a maximum of 2,100 male inmates. This is a privately ran facility under a contract with Correctional Corporations of America (CCA). Vocational training and academic courses are available to all inmates. Offenders can also receive mental health services, as well as medical and dental treatment while incarcerated at Hardeman County Correctional Facility. Inmates can also have visits on Mondays if the offender did not receive a visit on the weekend. Monday visits for general population inmates occurs from 6:30pm-8:30pm, protective custody inmates have visits from 4:30pm-6:30pm.